The sword cane appears in the Advanced Player’s Guide. 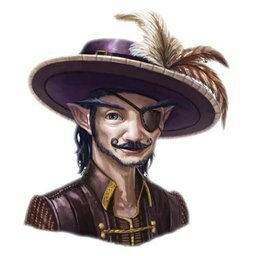 Conchobhar Shortstone is a handsome, honey-tongued gnome who wears a foppish purple hat, an eye patch, and a white silk shirt, and carries a dandyish cane. His appearance is that of someone pretending to be a pirate, rather than a true buccaneer. Conchobhar is a professional gambler who made the mistake of drinking with the Wormwood’s crew one night and failed to notice the cosh in a crew member’s hand until it was too late. He remained unfriendly to the PCs until the attack on the Man’s Promise, befriending them just before being chosen for Mr. Plugg’s skeleton crew. He was most grateful when they rescued him and Sandara Quinn from the grindylow lair in Riptide Cove, on Bonewrack Isle. Conchobhar is resigned to his fate but is determined to make the most of it, as he’s always yearned for the sea anyway. One thing dominates Conchobhar’s thinking — himself. Conchobhar is also a serial womanizer. He finds Rosie Cusswell magnificent. Though he is fond of the PCs, he does not seem to have a favorite among them. During Combat Conchobhar prefers to talk rather than fight. If he must fight, he lurks at the edge of combat, preferring to flank or attack with his bow. Morale Conchobhar flees if reduced to 7 hit points or fewer, but he fights to the death for any female character he is on friendly or better terms with.